It seems to be more of an effort to understand discussions with Facebook users over polarizing pop culture figures, places, and events, and also to make it easier for Facebook users to connect with each other over shared interests. If you think hashtags are overdone, you are probably right. However, hashtags are the common denominator among social sites like Twitter, Instagram, Tumblr, and Vine, which makes it easier to continue conversations or Trending Topics once posted on Facebook, versus changing the method of participating in public conversations altogether. 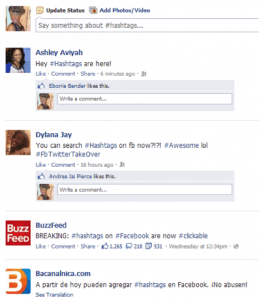 Facebook Hashtags will also be searchable in the same way you search a friend, place, or brand page on the website. Hashtags however, will stay native to your laptop. Mobile posts with the pound sign will not be clickable. Seeing as how more than 80% of the internet is now accessed via Smartphones, Facebook better get a move on it. One important thing to note for brands and users everywhere, Hashtags, like all Facebook posts, will have the privacy option. You will only be searchable if you’ve updated your settings to do so, and if not then this conversation will stay among #friends.